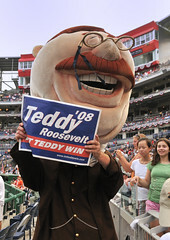 July | 2008 | Let Teddy Win! Teddy Roosevelt fans will have a chance to party with the big Bull Moose himself tomorrow night as Teddy hits the town to promote the new Miller Lite Party Nights at Nationals Park. From 10:00 to 10:45pm expect Teddy to be stopping traffic in Georgetown as he hangs out near the intersection of Wisconsin and M Streets. Our favorite racing president will then head over to 18th Street in Adams Morgan for the rest of the evening. It should make for a fun photo op! I can’t make it myself (I’m actually out of the country this week), but post your photos to the Presidents Race group on flickr and maybe we’ll share some in the future. Teddy’s T-Shirt Tuesday: Mark Your Calendar! 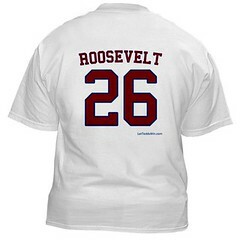 Teddy Roosevelt’s T-shirt Tuesday is right around the corner, and many of you have asked if we’ll be organizing a Roosevelt rooting section at Nationals Park. It’s a great idea, and so on August 12, we’ll plan to gather before the first pitch at 6:45pm right behind Section 102 on the centerfield plaza. Bring your Teddy Roosevelt signs and wear your Let Teddy Win gear, and we’ll have a little pregame rally for the camera crew. 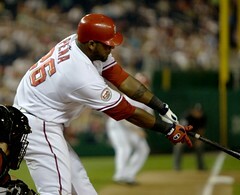 Later, for the big event in the 4th inning, we can gather to cheer close to the presidents race finish line. For those who haven’t been paying attention, the Nationals are celebrating every Tuesday night home game with “T-Shirt Tuesdays,” where the first 10,000 fans entering Nationals Park receive a free t-shirt. 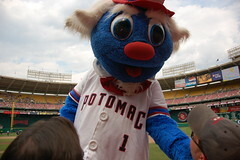 Each Tuesday’s t-shirt has a different theme on the back, and four of the T-Shirt Tuesdays were set aside to celebrate the Nationals racing presidents. 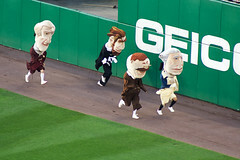 So far, George Washington, Thomas Jefferson, and Abe Lincoln have had T-Shirt Tuesdays, and each has won the presidents race on his respective night. Teddy Roosevelt’s big day is next, on August 12. He should have his best effort saved up for the big day. Plenty of tickets are still available, though with the Mets in town, the best seats are going fast, so order now. A 100-year tradition was extended last night to Nationals Park, as our Nationals’ new home stadium was host for the first time to the annual Congressional Baseball game. With tickets going for $8.00 each, the event usually raises over $100,000 for local Washington, DC charities, but make no mistake. Competition on the field is fierce and bragging rights much sought-after as many of the participating congressmen are former athletes, and the Republican legislators were eager to extend their 7-year winning streak over their rival Democrats. The rematch of last year’s starting pitchers, Rep. John Shimkus (R, IL) and Rep. Joe Baca (D, CA), went back and forth until the seventh inning, when Rep. Connie Mack IV (R, FL, grandson of hall-of-famer Connie Mack, Jr.) got the game-winning RBI off Baca as the Republicans took their 8th straight by a score of 11-10. 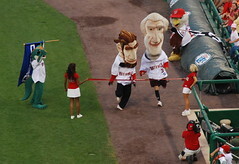 The game featured an unofficial running of the presidents race, in which George Washington beat Abe Lincoln to the finish line.